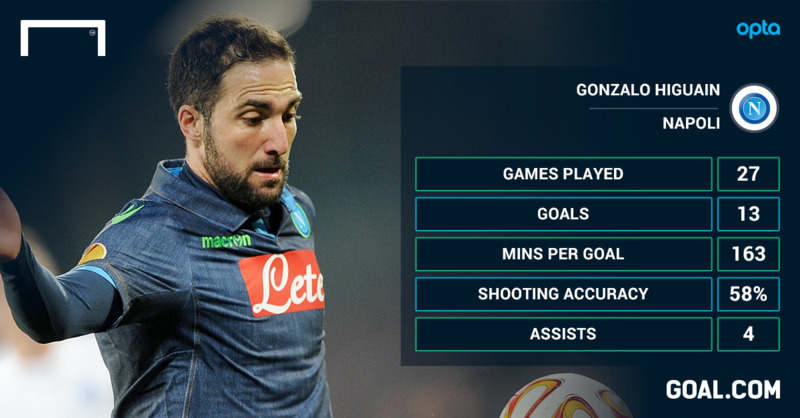 Liverpool are keeping tabs on Napoli ace Gonzalo Higuain as the Premier League side step up their search for a new striker. The 27-year-old has been linked with a move away from Italy at the end of the current season despite the Partenopei’s desire to tie him down to a more lucrative contract. With key clashes in Serie A, the Europa League and the Coppa Italia coming up in the next few weeks, talks between the Italian club and their star forward have been shelved until the end of April. However, Higuain’s father, who is also is agent, is due to sit down with club president Aurelio De Laurentiis and Riccardo Bigon, the sporting director, at the end of the month, once the likelihood of Champions League football next season becomes clearer. The Partenopei are willing to up the Argentine’s basic salary and extend his current deal, which runs until 2018, by a further year. However, while Higuain and his camp have publicly maintained that he is happy at the San Paolo, it is believed that a summer move would be welcomed. Liverpool have been keeping a close eye on proceedings and are expected to head up the queue should the former Real Madrid striker become available. Higuain has been linked with a move to Roma in the Italian press in recent weeks, while reports in both Italy and Spain this week have suggested that Barcelona are in the market for a ‘Plan B’ forward, and that Higuain fits the bill alongside Juventus striker Fernando Llorente. Any move to Anfield would further complicate the future of Mario Balotelli, who moved back to England from AC Milan in the summer but has struggled to adapt to life under Brendan Rodgers this season. The Reds boss has hinted on several occasions that the Italy international was not his first-choice signing and has publicly insisted that he improve his workrate and pressing of defenders if he is going to make it on Merseyside. The 24-year-old has been linked with a move back to Serie A, usually with Sampdoria, since October when he was chastised for swapping shirts with Real Madrid’s Pepe at half-time of their Champions League clash. A hamstring injury at the end of November hampered his progress further, and by the time he had returned to fitness Rodgers had moved to the 3-4-3 formation which propelled the club into the race for a top-four finish. Balotelli has appeared to struggle with the new-found system, although he may get another chance to nail down a starting berth given fresh concerns over Daniel Sturridge’s fitness. However, tentative interest in Higuain highlights that Rodgers is moving ahead with his plans for next season, amid increasing uncertainty over Raheem Sterling’s future, and Balotelli could also be cut adrift. This entry was posted in News on 01/04/2015 by mirsinho.